Our interesting and noble town glories in its many grand architectural features but of what might be termed arresting and notable ‘objets d’art’ there are surprisingly few examples. However the prestigious Yale University Press has recently published one of its beautifully produced art history volumes featuring a hidden gem – right here in Stamford. 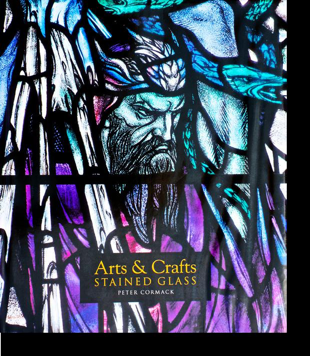 The book, by Peter Cormack, is entitled “Arts & Crafts Stained Glass”. In this lovely book Cormack provides the first extensive study of how the late 19th century Arts & Crafts Movement transformed the aesthetics and production of stained glass in Britain and America. They were a progressive school of artists committed to direct involvement in making and designing windows; reinventing stained glass as a modern expressive art form. Using innovative materials and techniques they rejected the formal Gothic Revivalism while still seeking creative inspiration in medieval traditions. ​The pioneer of this approach was Christopher Whall (1849-1924) whose charismatic teaching educated a generation of talented pupils – both men and women. They produced intensely colourful and inventive stained glass, using dramatic, lyrical and often powerfully moving design and symbolism. So where in our town do we go to find examples of Whall’s work? The answer is St Mary’s Church in its Corpus Christi Chapel at the East end of the North Aisle. There you have two exciting examples: the East window of the Chapel and the window in the North wall. Both windows are given a good deal of space in this lavishly illustrated volume produced for the Paul Mellon Centre for Studies in British Art. You have never seen them? Then visit the Church which is open daily and a good time to go is around 11.30am (before midday Mass on Monday, Tuesday, Wednesday and Friday). The Chapel is usually locked, for security reasons, at other times but the windows are always quite visible. Go and admire the splendidly armoured St Michael or the delicate Eve, complete with her distaff. They are a feast of colour and bold design. Compare them to earlier 19th century more insipid and certainly less colourful windows. Certainly an art treasure in our midst, of national importance. Next page: Big, Bigger, Better?